Here is a model preset guide for Ocarina of Time/Majora's Mask with pictures. This guide is in feet and units. Some parts of the original guide are copied over and/or modified. Adult Link is added for comparison. - When connecting two rooms, you must put a door model in each room you want Link to enter and exit from. - When creating the doorways: With the collision, you want to make an invisible barrier (that way Link cannot walk through the wall into the next room). - There will need to be an individual wall for Link to interact with. This is the "doorway", which is what you press A on to enter. This "wall" must be placed 1'8 feet (20 units) inside of each side of the crawlspace. The solid side must also be facing inwards. - The actual ladder must be it's own component, and be named "Ladder". Hylian Toolbox will recognize this as a ladder, but you can also manually add the ladder flag. - The climb down interaction is placed at the top of the ladder, white side (solid side) facing out. Make this piece a component and name it "LadderTop". If using Hylian Toolbox, it will recognize this and it should work as soon as you import your map. If not, you can give this component a "ladder top" flag. - Ladders should be placed five inches (5") (Units: 60) from whatever wall Link is climbing onto. 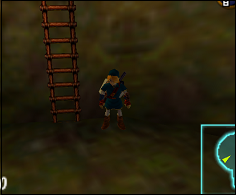 This ensures the ladder has the space so Link can climb off and on (at the top) perfectly, and is genuine to the games. This also separates the ladder top component from the actual ladder. - This is for the collision of the fence. The mesh has the texture, with the texture double sided in the middle. 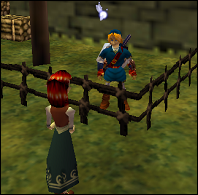 - This is the fence where Young Link will climb onto and Adult Link will hop over. I made some pre-made doors, ladders, and crawlspaces here: .skp, or .obj and .mtl.